COLORADO SPRINGS, Colo. – Five first-time winners were chosen as American Quarter Horse Association/Professional Rodeo Cowboys Association Horses of the Year, which were announced Oct. 10. Three horses were named in each of the six categories, and the lone repeat champion was team roping heeling horse Zans Colonel Shine (Colonel), which is the mount for Jake Long. 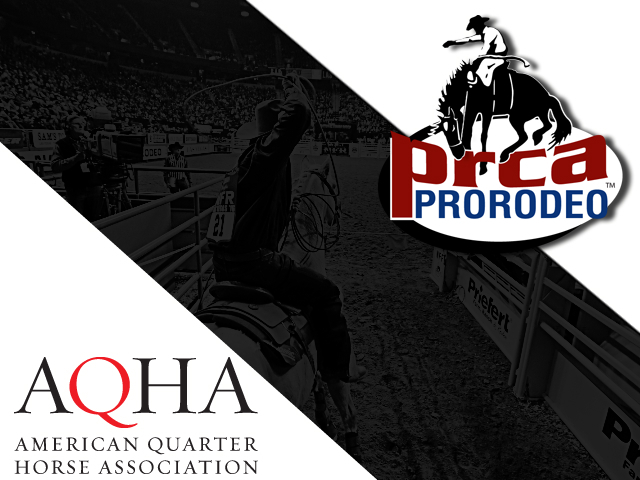 Long enters his seventh Wrangler National Finals Rodeo presented by Polaris RANGER fifth in the WEATHER GUARD® PRCA World Standings. Long owns the horse with his wife, Tasha, and the horse helped him win rodeos at the Gladewater (Texas) Round-Up Rodeo, and Kit Carson County Fair & Rodeo (Burlington, Colo.) with partner Luke Brown, who is fourth in the team roping header standings. On the other side of team roping, Chad Masters’ horse Madison Oak (Clint), an 11-year-old he has owned since the horse was 4, took top honors. Masters, a two-time world champion (2007, 2012), is headed to his 11th WNFR. Masters and his partner, Travis Graves, had a strong regular season, which included Masters riding Clint to the win at California Rodeo Salinas. Masters enters Las Vegas seventh in the world standings. Back in 2015, Clint finished third in the AQHA/PRCA Horse of the Year voting. “For the group of horses that are in there, for mine to do good, means a lot to me,” Masters said. The bulldogging mount which won Horse of the Year is Canted Plan (Scooter), owned by Tyler Pearson and Kyle Irwin. Pearson enters his second WNFR third in the world standings and Irwin is 11th. During Pearson’s career-best regular season he had several wins, including at the Wrangler Champions Challenge presented by Justin Boots (Sioux Falls, S.D. ), and the Lawton (Okla.) Rangers Rodeo. Irwin, meanwhile, is headed to his third WNFR and had big wins aboard Scooter at the Cody (Wyo.) Stampede, the Canby (Ore.) Rodeo, and the St. Paul (Ore.) Rodeo. Shane Hanchey’s tie-down roping horse, Simon Cow (Si), claimed the top spot. Hanchey, the 2013 world champion, has owned the horse since May of 2015, and he helped Hanchey finish third in the regular season world standings and qualify for his eighth career WNFR. The steer roping horse which took the top spot was John Bland’s Carols Sassy Doc (Salty). The horse helped Bland have the best season of his career and powered him to his first appearance at the Clem McSpadden National Finals Steer Roping, Nov. 10-11 in Mulvane, Kan.
Salty is 16 years old, and Bland has owned him his entire life. “This is unbelievable to know that we’ve been together this long and that everybody thinks as much of him as I do,” Bland said.